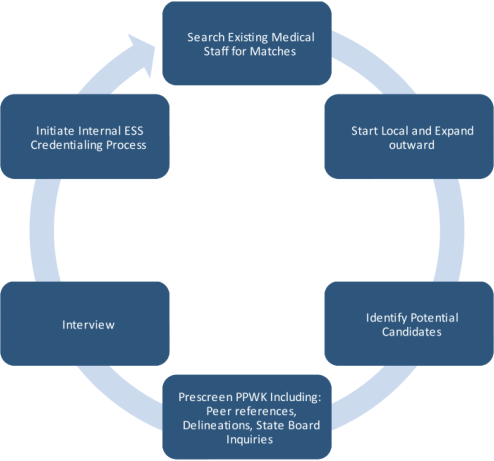 ESS maintains, and continuously adds candidates for, a clinician pool of candidates nationwide. With a large and experienced recruiting, credentialing and scheduling team we are well-positioned for locating and enlisting top notch clinical talent for even the most difficult locations. The ESS recruitment and operations team is very popular among candidate physicians due to a core-level focus on personal service. They are trusted for a commitment to matching the right clinician to the appropriate environment; this makes for a more positive working relationship for all. Know a colleague who sounds like a fit for any of our ESS opportunities? Pass a name along & earn $1000 for full-time or $500 part time for a successful connection.